Preschoolers can pencil in a new set of playdates with more of their favorite Muppets! Noggin, Nickelodeon's commercial-free, educational network for kids 2 to 5, will premiere a brand-new season of the half-hour interactive series, Play With Me Sesame. 17 new episodes of the hit preschool series will begin airing on Saturday, June 7 at 8:00 a.m. (ET/PT) and will air regularly every day at 8:00 a.m. (ET/PT) on Noggin. 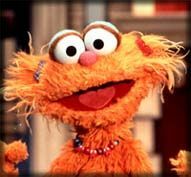 The second season of Play With Me Sesame will feature special Muppet guest stars including, Cookie Monster, Zoe, Slimey the Worm and Ernie's cousin, Ernestine, in addition to the show's regular Sesame Street characters -- Ernie, Bert, Grover and Prairie Dawn. The new episodes will feature new original songs including, "I Love My Sippy Cup," "The Groverelli," and "Wubba Lullaby," among others. On June 7, Noggin's website, noggin.com, will premiere enhanced versions of Play With Me Sesame games hosted by Ernie, Bert, Grover and Prairie Dawn which support preschoolers' creativity and individual expression. The online activities tie-in closely with the television segments and include 'What's Different?' 'Perfect Pair,' 'Pigeon Patterns,' 'Oatmeal Art,' where kids can submit their work for TV and online art galleries, and all-new rubber duckie games. Play With Me Sesame mixes classic Sesame Street footage with newly created games and activities where the Muppets invite children to join in. Play With Me Sesame extends Sesame Street's time-tested educational mission through opportunities for active learning. The participatory design encourages preschoolers to express themselves creatively, while the games and activities support such cornerstone cognitive concepts as 'same' and 'different.' As an interactive experience, the program helps children cultivate skills and attitudes needed to succeed in the social environment of school. Noggin / The N, owned by Nickelodeon, currently reaches 34 million households via cable, digital cable and satellite. With two distinct program blocks, NOGGIN for preschoolers and The N for teens -- the network helps kids to figure out their lives with educational media on-air and online.